A large home of mediterranean influence on a charming corner lot in one of Fort Worth's most desirable neighborhoods. With more than adequate square footage, hardwood floors, tall ceilings, and numerous windows, the homeowners were in love with almost everything about their newly purchased home... Everything except for the builder-grade cabinets and design finishes. These days, if you are lucky enough to get your hands on a home with the perfect layout in a fabulous neighborhood, you can always enhance a basic interior. The homeowners at Monticello Drive called on the Morrissey team for the interior redesign and remodel of their kitchen and Butler's pantry. Self-described "foodies", our new clients wanted a perfect kitchen to call their own. My client previously assembled a blend of carefully curated antiques and custom upholstered pieces, so inspiration for the new kitchen wasn't hard to come by. One of the home's standout pieces is a distressed wood table with a unique iron base, salvaged by Fort Worth's Simple Things out of a San Francisco fish market. It would serve as a dine-in table for our new kitchen. Embellished cement tiles: A nod to the home's mediterranean influence. Having the fish market table as our inspiration, we established that we would incorporate its elements in the new finishes. 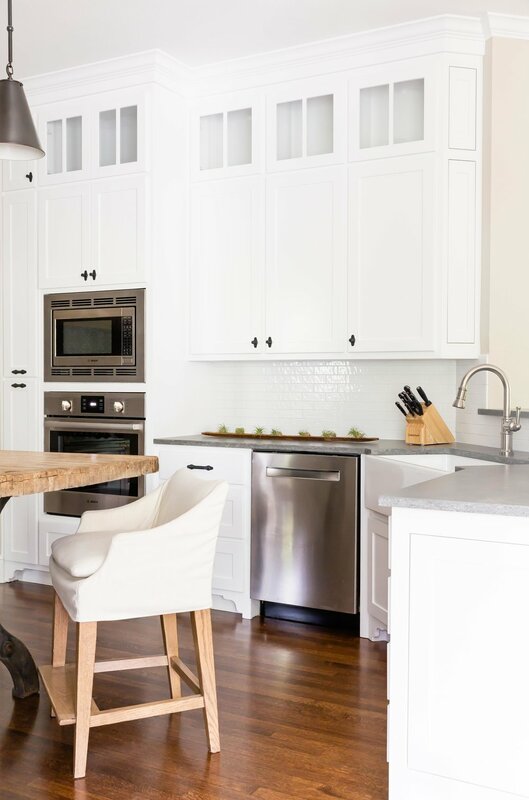 The custom white shaker cabinets were begging for a nod to rustic vintage. I asked my cabinet builder to trim the base of the new vent hood in cedar. Our team bleached the raw cedar until we got the patina to match the vintage fish table. I sourced matte black hardware for the cabinet knobs and drawer pulls. The exposed details and curved backplate on the hardware give the cabinets a refined vintage appeal. Working together with my client on a quest for unique countertops, we discovered a Caesarstone product with the characteristics of un-oiled soapstone-- perfect for our refined vintage vibe. We perused through hundreds of catalogue pages until we landed on the perfect pendants to hang above the kitchen table. Pewter shades with decorative chains provide the perfect touch of classic elegance.